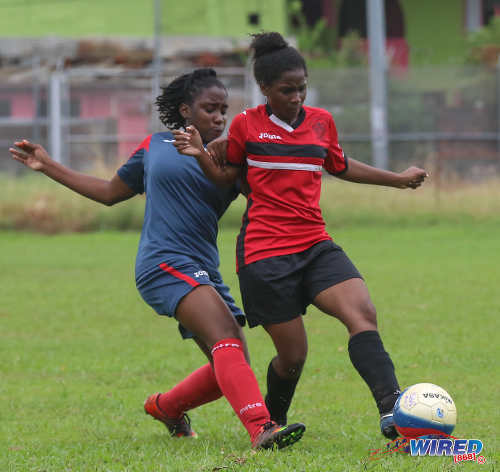 Photo: Bishop Anstey POS forward Kiana Alexander (right) holds off a Bishop East defender during Coca Cola National Intercol semi-final action at the St Augustine Secondary ground on 30 November 2017. 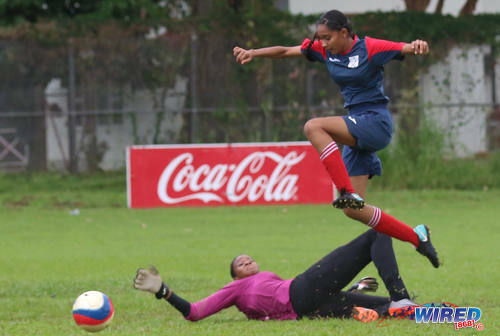 Photo: Bishop Anstey East midfielder Sarah Guyadeen (right) hurdles Bishop POS goalkeeper K’lil Keshwar during Coca Cola National Intercol semi-final action at the St Augustine Secondary ground on 30 November 2017. 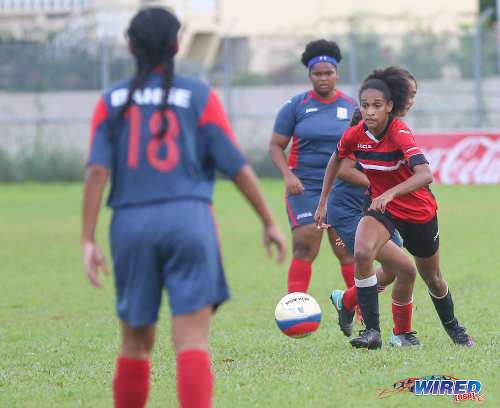 Bishop East flanker Tyanna Williams can attest to the rugged nature of the opposing back four, as she huffed and puffed without ever getting a clear sight of goal, before a strong challenge from opposing midfielder Arissa Romany ended her on-the-field afternoon. 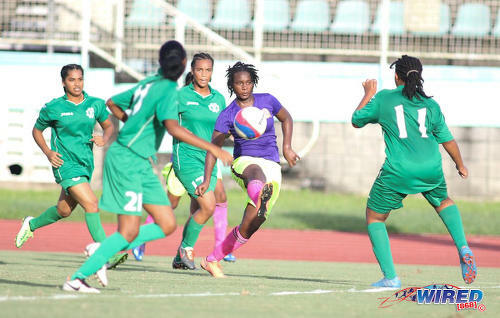 Photo: Bishop Anstey POS defender Brittney Williams (right) looks for a teammate during Coca Cola National Intercol semi-final action against Bishop East at the St Augustine Secondary ground on 30 November 2017. At the other end, Ward looked a bright prospect in central midfield for Bishop Port-of-Spain while forward Chantal Murrell buzzed cleverly between the lines. But the East back four, protected by the deep-lying Wood, was not easily breached either. 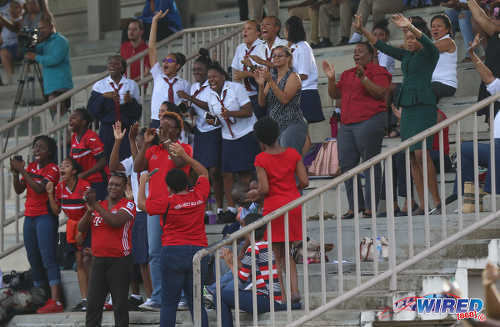 Photo: Bishop Anstey POS fans cheer on their team during Coca Cola National Intercol semi-final action against Bishop East at the St Augustine Secondary ground on 30 November 2017. 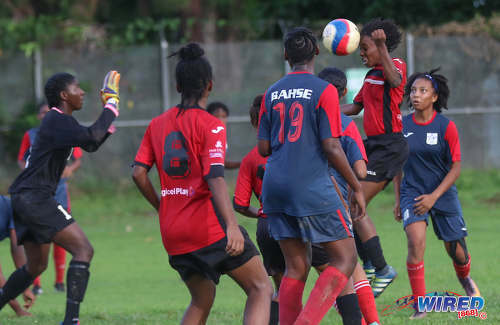 Bishop Anstey High School (POS) (4-4-2): 1.K’lil Keshwar (GK); 2.Anna Blake, 18.Brittney Williams, 6.Tracey Pollard, 11.Maia Salandy; 7.Leah Dos Santos (captain), 10.Ranae Ward, 17.Selene Smart, 8.Arissa Romany; 14.Chantal Murrell, 9.Kiana Alexander (16.Joanna Kennedy 70). 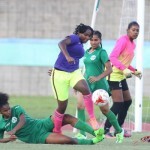 Unused substitutes: 22.Kesi Bennett (GK), 21.Brianna Panteau, 19.Nia Thomas Brown, 4.Tianna Aming, 15.Raesa Ali, 12.Anais Ferguson. 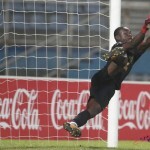 Photo: Bishop Anstey POS midfielder Ranae Ward (second from right) heads towards goal while Bishop East goalkeeper Malaika Dedier prepares to pull off a save during Coca Cola National Intercol semi-final action at the St Augustine Secondary ground on 30 November 2017. Bishop Anstey East 0, Bishop Anstey (POS) 1 (Kiana Alexander 67) at St Augustine Secondary. 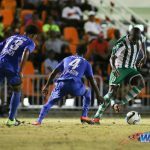 Photo: Pleasantville Secondary playmaker Jasandra “Mama” Joseph (centre) takes on the Carapichaima East Secondary defence during Coca Cola National Intercol Semi-final action at the Mannie Ramjohn Stadium in Marabella on 29 November 2017. 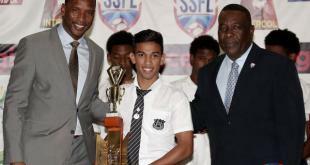 San Juan North v Shiva Boys Hindu College, National Boys Intercol final, 5pm, Ato Boldon Stadium.